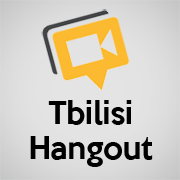 Tbilisi Hangout is a weekly Google Hangout with Mirian Jugheli and Nicholas Alan Clayton. We talk about stuff in Georgia and what not. Two journalists in Tbilisi. Lots of opinions. Through the wizardry of Google Hangouts, join Mirian Jugheli and Nick Clayton every Wednesday at 20:00 Tbilisi time and watch and listen as they talk all things Caucasus — news, sports, food, and whatever else is on the menu. Ladies and gentlemen, in the left corner, member of the Parliament, Sergo Ratiani, United National Movement. Starting from November 28, Every Wednesday at 20:00 (Tbilisi time) me and Nicholas Clayton will talk about current affairs of Georgia on Google Hangout. The live webcast is called Tbilisi Hangout and it is about politics, society, sports and whatever nonsense we find interesting. We are trying to make it as interactive as possible, hence you can ask questions or leave comments, decide what you would like to hear next week and also join us with your web camera. Occasionally we will be coming live from various locations like bars, offices, streets, etc. You can subscribe to this YouTube channel in order to be updated about upcoming hangouts. Here’s the first Tbilisi Hangout. In this episode we talk about anti-Ivansivhili articles in western media, global amnesty, mandatory ID cards, Georgia rugby, etc. let us know what you think. The President of Georgia Mikheil Saakashvili and the leader of Georgian Dream coalition Bidzina Ivanishvili, who is set to become the Prime Minister of the country, met on October 9 at the presidential palace. The meeting, that was also attended by representatives of the current government and Georgian Dream coalition, lasted for about 35 minutes after which both Saakashvili and Ivanishvili gave commentaries to public. After the first images were out, Georgians on Facebook began to react. Some of them claimed that Ivanishvili looked mad, some wrote that Saakashvili looked sad, others said that the meeting looked like El Clasico (A football match between Real Madrid and FC Barcelona), etc.